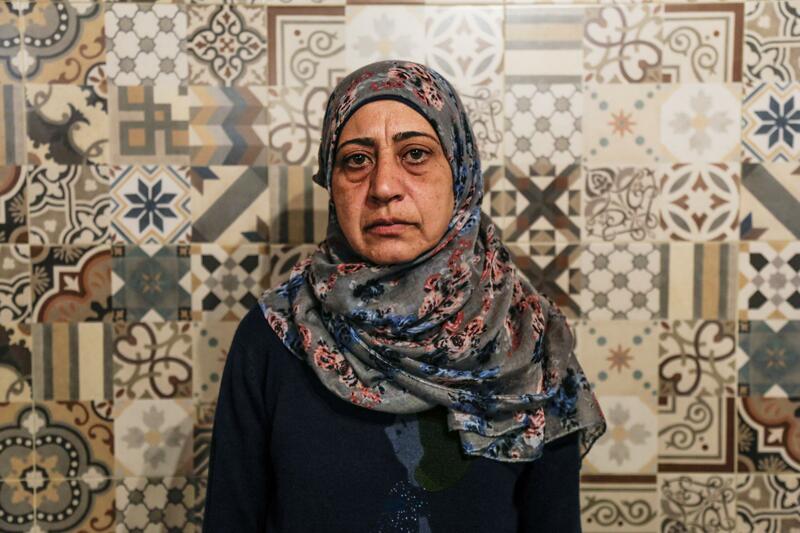 Amal Adwan, a 47-year-old teacher from Damascus, Syria, must stay on Lesbos until she exhausts all appeals for her asylum request, which was denied on the basis that Turkey is a safe country. "Syrians face discrimination in Turkey," she says. "We cannot find work, and if we do, they don't pay us." A section of the crowded and trash-strewn Moria refugee camp on the island of Lesbos, Greece. 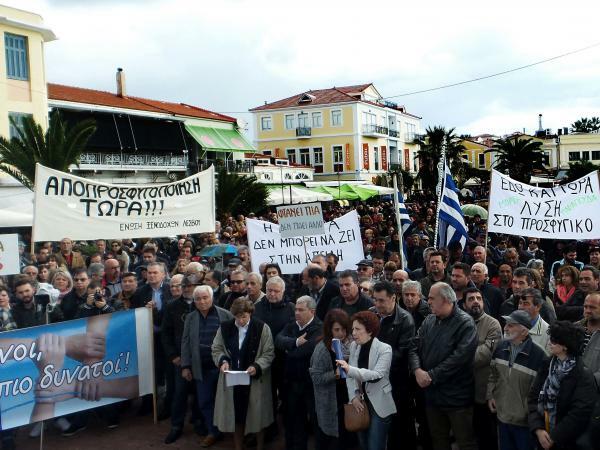 Residents of Lesbos demonstrate on Nov. 20, 2017, against an increase in the number of asylum-seekers on the island. Kleoniki and Panagiotis Chronis live in the village of Moria, for which the nearby camp, previously an army barracks, is named. "What's happening here is unacceptable," Kleoniki Chronis says. "Unacceptable for the refugees, for us, for Greece and for Europe." Ahmed is 25, tall and no-nonsense, with three young children and a wise-cracking husband, Waleed, who worked as an ironsmith and roofer in Deir Ezzor, the city in eastern Syria where they're from. They left Syria in November, worn down by a war that, after seven years, appears to have no end in sight. 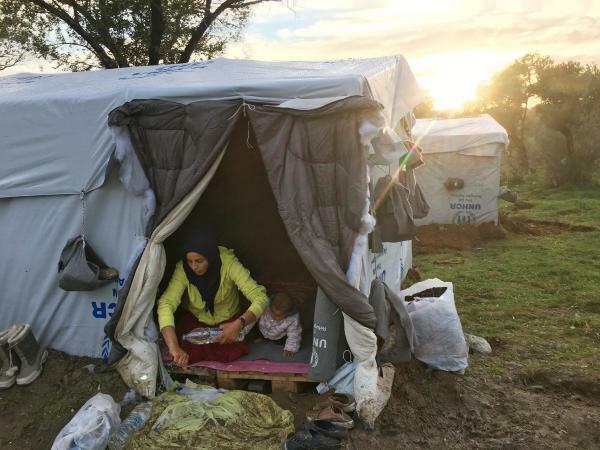 They tried to live in Izmir, Turkey, but after only a month there, they felt trapped. Turkey hosts more refugees — 3.5 million — than any other country in the world. Most are Syrian. Waleed could not find work, even the most menial and low-paying kind. They saw other Syrians begging on the streets. So they borrowed money to pay smugglers who helped them cross the Aegean Sea to Greece. The family arrived on the Greek island of Lesbos in December. Two years ago this month, under a deal the European Union sealed with Turkey, Lesbos and several other Greek Aegean islands became processing centers for migrants arriving to the EU by sea. They aren't allowed to leave these islands until their requests for asylum are processed. Those who are denied are supposed to be deported to Turkey. 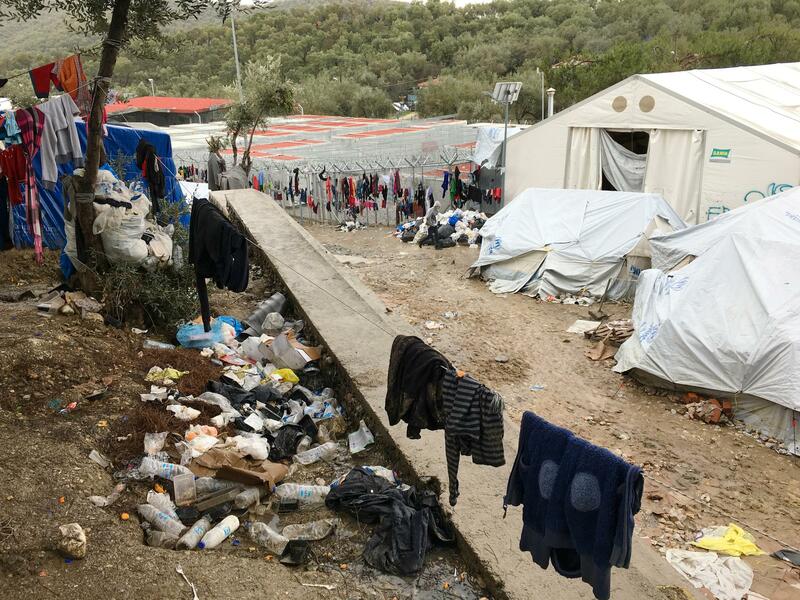 Those who receive asylum can go on to mainland Greece — to subsidized housing or, if that's not available, to another refugee camp that's better equipped than those on the islands. Ahmed says she didn't realize that Europe had soured on asylum-seekers and that several EU countries are trying to block them from arriving. A smuggler in Turkey told her and her husband that refugees are welcome in Europe and the family would have to stay for just a couple of weeks in Greece and then could go on to Germany. When they arrived on Lesbos, Greek police took them to an EU-subsidized camp run by Greek authorities and international volunteers, but it terrified them. Trash lined every corridor. The overwhelming stench of rotting garbage, urine and feces made them want to vomit. The few toilets overflowed with human waste. Women shared tents with unrelated men. Other refugee women warned Ahmed not to walk around by herself — there were drug dealers and drunk men. She heard people screaming in food lines and watched fights break out. She looked up and saw razor-wire fencing. "Europe does not see us as human," she remembers thinking that day. The European Union started closing its borders to migrants in October 2015, when Hungary blocked asylum-seekers who had previously been waved through the Balkans and Central Europe so they could reach Western Europe. It was the height of Europe's refugee crisis. That month alone, the U.N. recorded more than 200,000 migrants crossing from Turkey to Greece — all of them bound for Western Europe. By the end of 2015, more than a million migrants had entered the EU. Most were from war zones — Syria, Iraq, Afghanistan. More border closures followed. By February 2016, with thousands of migrants stuck in Greece, Greek Prime Minister Alexis Tsipras was warning that the country was becoming a "warehouse of souls." The next month, the EU worked out its deal with Turkey aimed at discouraging migration. Just before the deal was sealed, European Commission President Donald Tusk hinted that anyone who didn't qualify for asylum would be swiftly deported. "Do not come to Europe," Tusk warned would-be migrants. "Do not believe the smugglers. Do not risk your lives and your money. It is all for nothing." The EU paid Turkey roughly $3 billion to accept deportees and better patrol its coast to prevent more migrants from entering Europe. It also promised to fast-track EU visas for Turks and expedite Turkey's EU membership process. And the EU said it would accept Syrians in refugee camps after they'd been vetted in Turkey. Two years later, the number of asylum-seekers crossing from Turkey has dropped by more than 80 percent, with 29,595 arriving in Greece in 2017. Most of the nearly 172,000 migrants who crossed the Mediterranean last year went to Italy, despite efforts to keep them away. After they arrive on the Greek islands, the Greek Asylum Service, which is understaffed, often takes months to process asylum requests. If the requests are rejected, they're often followed by lengthy appeals. Amal Adwan, a 47-year-old teacher from Damascus, arrived on Lesbos from Turkey about seven months ago. Her asylum request was rejected on the basis that Turkey is a safe country for refugees. "I was shocked," she said, "because I didn't know that there was a deal with Turkey to send us back. I found out about [it] when I arrived on the boat. It's like Europe no longer accepts Syrians as refugees." While living for months in Turkey, she said she tried repeatedly to find work, to no avail. She worried about being forced to live on the streets. Now she has appealed Greece's rejection of her asylum request, and is waiting for an answer. "I want to land somewhere where I can support myself. I will stay in Greece if I can get a job," she said. "I speak English. I am educated. I don't want to be dependent on state handouts." Maria Stavropoulou, the former director of the Greek Asylum Service, told the newspaper Kathimerini in January that there was a backlog of more than 9,000 asylum cases at the time. "If there were no arrivals on the islands, I would say that [asylum] proceedings could be completed in two to two-and-a-half months," she said. In 2017, the number of asylum claims in Greece rose by 15 percent, according to the asylum service. Its staff received 58,661 asylum requests in 2017 and awarded protection to 10,364 people. Applicants came mostly from Syria, Pakistan, Iraq and Afghanistan. Stavropoulou added that only 16 percent of migrants arriving can be returned to Turkey under Greek and EU law. Far fewer have in fact been returned. Only about 1,400 of the more than 46,600 migrants who arrived on the Greek islands since the March 2016 deal have been returned to Turkey, according to the U.N. refugee agency. As a result, the refugee camps on Greek islands, built to house no more than 2,000 people each, often hold more than three times that number. Leila Hassan, who's 20 and from Somalia, said that when she first arrived at Moria camp, she wanted to turn around and go back to Mogadishu. "Because [the camp] is like a prison, and we are the criminals," she said. Eva Cosse of Human Rights Watch says this is exactly the message the EU wants to send. "It's like the EU is saying, 'Don't come here, because if you do, this is what you're going to suffer,' " she says. "Overcrowded, very dirty, very unsanitary camps, sleeping literally on the concrete, on the ground. And this is happening in the European Union. It's unimaginable." Human rights groups want the EU to end the so-called containment policy and let asylum-seekers leave the islands and go to the Greek mainland while awaiting a decision on their claims. But Gerald Knaus, who leads the European Stability Initiative, a Berlin-based think tank, and served as the main architect of the EU-Turkey deal, says that would void the deal and "only result in a return to the status quo, which was a situation where, on an average day in January or February 2016, 2,000 people were coming to the Greek islands, a lot of people drowned, and those who made it were moved to the mainland, so the humanitarian crisis existed elsewhere." The EU has allocated nearly a billion euros, more than $1 billion, in migration aid to Greece and insists Greek authorities are responsible for managing refugee camps. But the former migration minister, Yiannis Mouzalas, who was replaced this month, repeatedly criticized the EU for failing to provide extra staff to the asylum service and for taking too long to relocate refugees, including many unaccompanied children in Moria camp. When Mouzalas handed over his post to Dimitris Vitsas in a public ceremony, he warned Vitsas that Greece is in a "very difficult phase of the migration crisis." "We have messages from the U.N. refugee agency regarding a new crisis in Syria and a lack of funding for camps in Turkey, Jordan and Lebanon," Mouzalas said. "The conditions are being created again for a new crisis." Managing migration remains one of the EU's biggest challenges. It's caused a political backlash in countries from Britain — where anti-migration feelings fueled the Brexit vote in 2016 — to Hungary, where Prime Minister Viktor Orban is poised to win re-election next month amid statements that migration will cause "terror, women and girls will no longer be safe and our cultural identity will ...evaporate." Another anti-refugee EU leader, Austrian Chancellor Sebastian Kurz, has said that the EU must be ruthless when it comes to migrants. "Our approach must be to protect the external borders and to tell whoever tries to come to Europe illegally, 'you won't get through,' " he told Politico in 2016. Kurz holds up Australia's treatment of asylum-seekers as a model. He has suggested the EU use Greece's Aegean islands in the same way that Australia has parked asylum-seekers for years in neighboring Pacific nations such as Nauru or Papua New Guinea. "Those who oppose refugees say, 'Well, it's very simple, we just send them back,' " the European Stability Initiative's Knaus said. "Australia did stop people coming by basically saying anybody who comes will be denied the chance to apply for asylum in Australia and will be moved to some islands." But Greek islanders do not even want the current camps expanded. In February, lawyers from islands that house migrants — Chios, Lesbos, Kos, Samos and Rhodes — held a news conference threatening to sue on the islands' behalf, on the basis that the detention of migrants on the islands is a violation of both Greek and international law. "Why is this happening at all?" Rasha al-Ahmed, the 25-year-old Syrian mother, and her family did not stay inside the Moria camp on Lesbos. It was just too crowded. Instead, after a couple of days, they improvised a tent on a neighboring hill dotted with olive trees. They made the tent out of salvaged wood, rusting metal rods and recycled tarp that leaks when it rains. "The hardest thing for me is to try to find a proper place to get clean," Ahmed said back in December. "I wash the kids every day, even in cold water, but I can't keep them clean because of all the mud. I haven't taken a shower in two weeks." Hundreds of other migrants also pitched tents in the olive groves that surround the camp. This troubled Panagiotis Chronis, a 72-year-old retired computer engineer who lives in the lemon-scented village of Moria, for which the camp, previously an army barracks, is named. "The migrant camp of Moria is now the second-largest town on Lesbos," he said. "Next to it, the village of Moria is just a tiny little thing." His wife Kleoniki, 59, laments that their village, a short walk from the camp, was once known for its well-preserved ancient Roman aqueduct. But since the refugee crisis started, the name Moria, she says, is "synonymous with Europe's 'Guantánamo.'" "What's happening here is unacceptable," Kleoniki Chronis says. "Unacceptable for the refugees, for us, for Greece and for Europe." 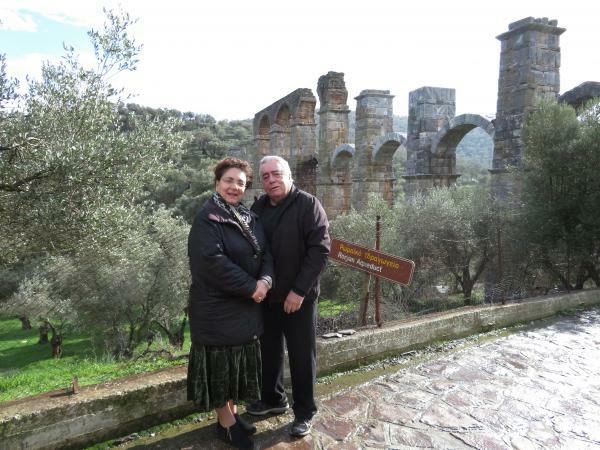 The villagers of Lesbos, many of whom are descendants of refugees from Anatolia in Turkey, have shown great generosity to asylum-seekers arriving on their shores. Some were nominated for the 2016 Nobel Peace Prize, and two shared the U.N. refugee agency's highest humanitarian award that year. But there are deepening concerns, especially in Moria, that the island has become an exile center for people that the rest of Europe doesn't want. Like other villagers, the Chronises are concerned that overcrowding at the camp is not only bad for the refugees, but also for their village. Panagiotis says migrants have stolen and slaughtered local goats and chickens, picked fruit off trees and chopped down olive trees for firewood. "If I was in the same situation, and my children were cold and hungry, I'd do the same thing," Kleoniki Chronis says. "My question is, why is this even happening at all? This is not a war zone. It's not the Third World. It's Europe. We are in the European Union."